When it comes to Stockmans, the Sowbelly is my favorite pattern. The stockman design, is well over a hundred years old and is unique in that the pattern was the first and possibly the only pocket knife developed specifically for sale in the USA. 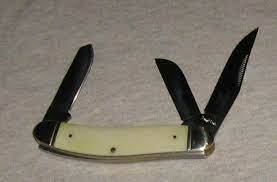 The blades originally planned for the knife were the blades needed by cowpunchers. The clip blade was for general cutting, the sheepfoot, for cutting line and trimming hoofs and spay blade for castrating animals. Stockmans come in a variety of handle styles with the serpentine handle being very popular. The sowbelly is a thick bodied, serpentine stockman. It gets its name from the noticeable curve in the handle. The belly shape allows for a better cutting position of the spay blade when it is in use and an easy grip of both the clip and sheepfoot blades..
One of the negative traits of stockmans is the chance for blade rub; normally between the spay and sheepfoot blades. I currently own six sowbellies and all of them have a small amount of blade rub. This occurs because the blades share the same channels when in the closed position and, while they don’t actually touch or hit each other when closing, they are normally pressed against each other when you grab the blade with the nail pull and open the blade. I've noticed a similar problem with Case, Bear and Camillus stockmans. What I like most about the Rough Rider Sowbelly is the fullness of the clip blade. Many makers give Sowbellies a long thin clip blade. The Rough Rider is about as traditional as you can get. As mentioned I own six Rough Rider Sowebellies. The white smooth bone was the first one I bought. I have found the pattern to be consistently well made, with exceptional fit and finish. If you like the Sowbelly pattern or if you've been thinkign about giving the pattern a try, then you should give a Rough Rider Sowbelly and try.